When the name Private Nicholson is thrown around by the Serjeant, it usually means Nicholson's been into some kind of trouble (which is often). 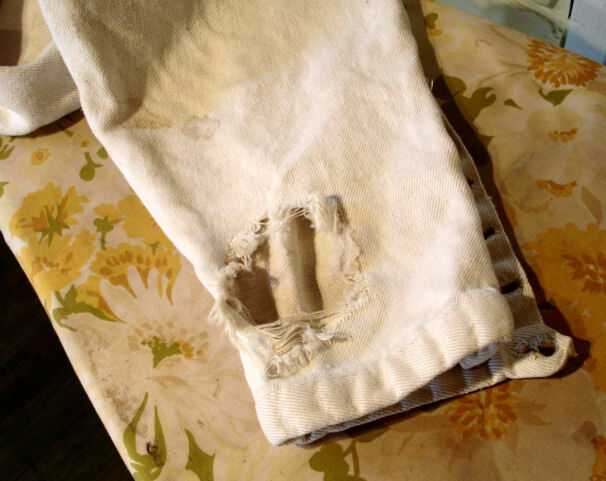 Take, for instance, the sordid tale of Nicholson's ripped breeches. How they got this way, we don't want to know. The important thing is it's now time Private Nicholson learned to fix what he has broken. In the 18th century, soldiers patched their own clothes (not their mothers -- not their girlfriends -- not their personal tailors) and they didn't just leave the holes to get bigger and worse. A soldier's clothes had to last through a very hard year and sometimes longer. In our century, your reenactment clothes can last years if you patch them well and they just get rougher and tougher and all-round more cool looking, while you bathe in the barrels of money you save. The following is a step-by-step guide as to how to repair a serious rip or hole. We've used modern materials and adapted period methods in this guide. This kind of patching can easily be done in the field with the basic materials from a soldier's housewife! 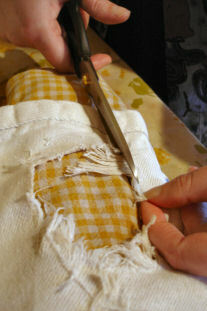 Please note, this is the method that we've been taught is a period-correct way of patching holes. Whether this is true or not, we don't really know, but we do know this kind of patch will hold your pants together forever*. Right then! Let's get started! 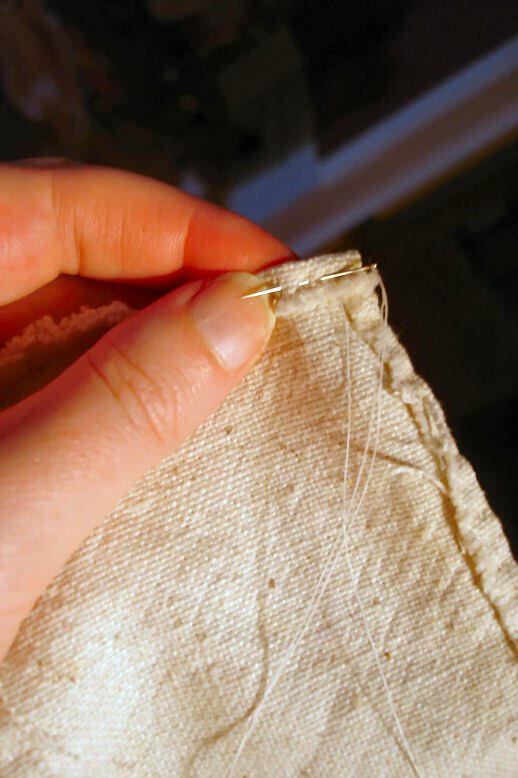 Here's one of the greatest secrets of good sewing. The iron is your best friend!!! Seriously, when it comes to any kind of sewing project, ironing the death out of everything (especially finished seams) will make the difference between a shoddy piece of boy-sewing and the smooth professional work of the manly man who knows what he's doing! Grrrr. 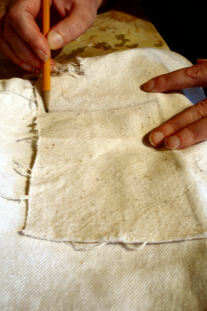 For the breeches repair, we settle the tailor ham (in this case, a rolled dish cloth) into the tube of the leg and mist with water. 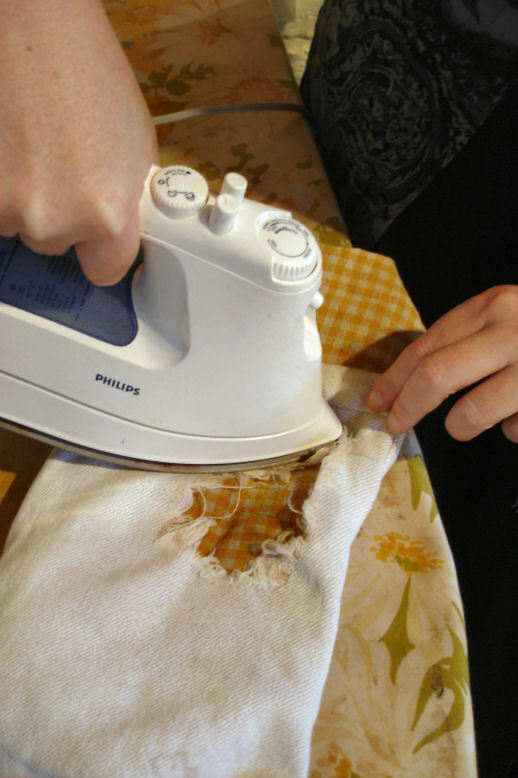 With the iron on the proper setting (linen, in this case), we press the area of the hole, flattening out any wrinkles and frayed edges. After the area has been ironed, cut away all the ugly fraying so that you have a nice clean-edged hole. Be careful, but don't be too worried about making the hole bigger. 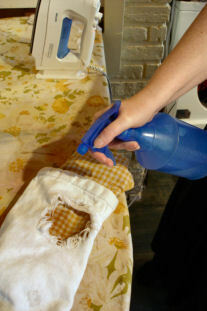 You would rather have a large clean patch, than too much fraying to tuck under. 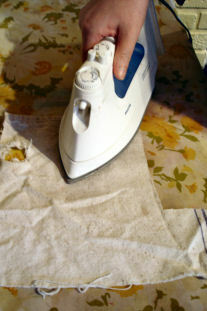 Once you've done all this, iron it again! Take a piece of strong scrap fabric. 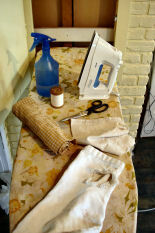 For breeches, linen canvas is ideal. This will be your patching material. 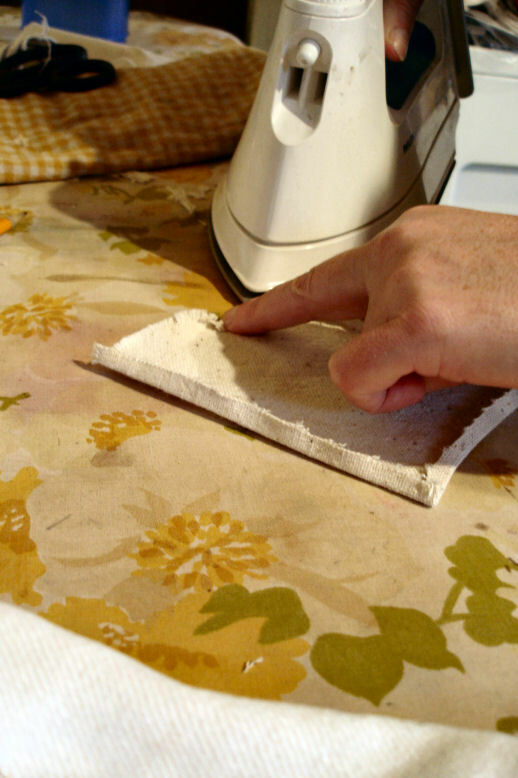 Give your patching material a good ironing. 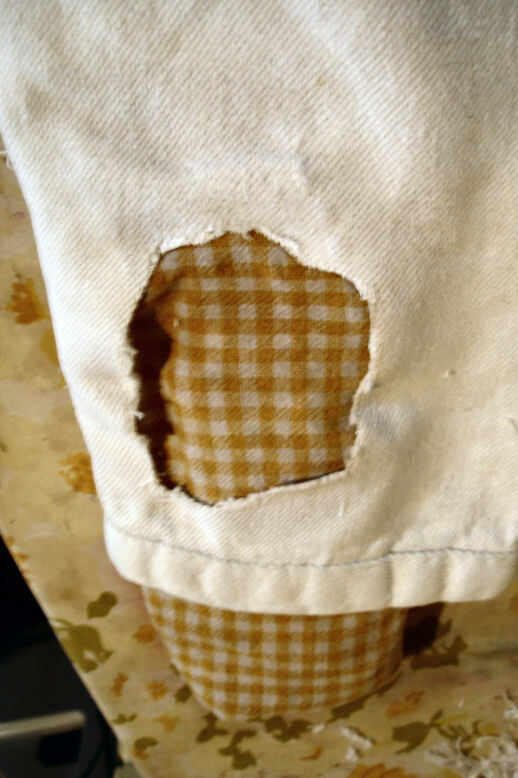 With your breeches inside out, place the patch material over the hole and trace a area that completely covers the hole by at least 3/4 inch all the way around. 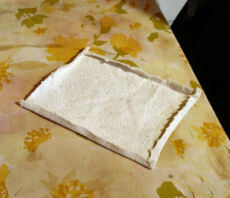 Cut the patch out, fold the edges, and iron them down about an 8th of an inch (look at the pictures). If you are in the field and don't have access to an iron, you can make creases by biting down the folds with your teeth, while wetting the fabric with your tongue. * by forever we mean the pants will rot before the patch does!